Posted June 15, 2010 in kinetics. To describe what I’m getting at, it is helpful to speak of an outdated 19th century philosophy known as Vitalism, which in Webster’s dictionary is defined as “a doctrine that the functions of a living organism are due to a vital principle distinct from biochemical reactions.” The term Vitalism was introduced to me by Kirby lister, Peter Sattler, during a debate on the nature of Kirby’s great talent. 19th century chemist and philosopher, Carl Reichenbach later developed the theory of the Odic force, which could be described as a field of living electro-magnetic energy that permeates all things. Kirby, a chronicler of Thor’s Norse mythology and no stranger to all things Odic, appears to have a direct conduit to such an energy source, which is apparent in the extraordinary vitality of his artwork. Vitalism, or something resembling it would continue to evolve as an idea. In the 1930’s, psychoanalyst Wilhelm Reich developed the idea of a universal life force that he called Orgone. 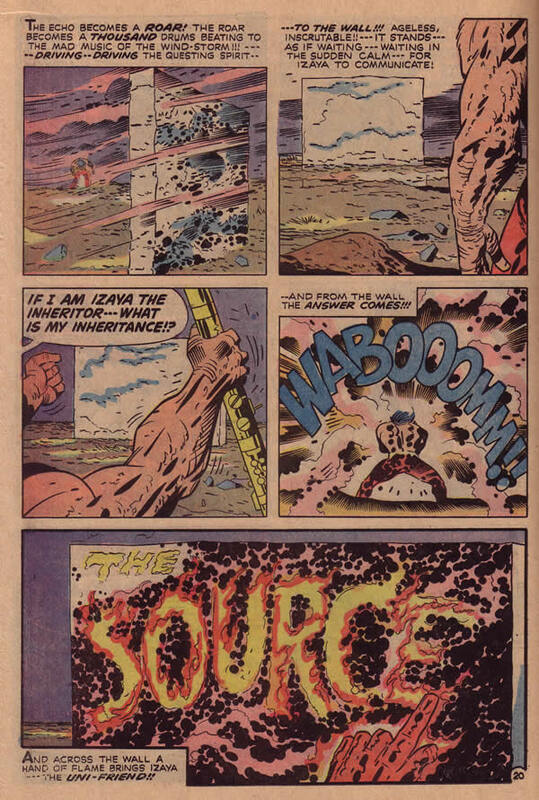 In Kirby’s magnum opus, The New Gods, the artist refers to The Source, an ineffable power that exists beyond even the comprehension of the New Genesis beings. The New Gods can harness the vital forces, but they are not the source of it. On page 20 of “the Pact” in New Gods #7, Izaya, New Genesis warrior, turns to the power of “The Source” to regenerate him in his new identity as Highfather. Kirby depicts the flaming hand writing its message on the wall, as vivid an image as the Old Testament’s Burning Bush. The hand ablaze is Kirby’s, compelled to create this modern mythology. The wall recalls the monolith from 2001, A Space Odyssey, a concept that Kirby will explore later in his career.